The humidity was as uncomfortable as the bleachers of Concordia Stadium. But the heat didn’t seem to distract Concordia on the field, as they held on for their first win of the season in the The Réseau du sport étudiant du Québec over arch rivals, the McGill Martlets. A first half penalty converted by Stingers midfielder Chama Sedki proved sufficient to edge past the Martlets 1-0 at home Sunday afternoon. Winless in their first five games to open the season, head coach Jorge Sanchez didn’t shy away from expressing his joy after the win. “Everybody did something today, it was a true team effort,” said Sanchez. Despite McGill’s continuous attacking pressure, the Stingers appeared kept a cool head, and an organized defence. Their play on the back end proved to be decisive in the final result. 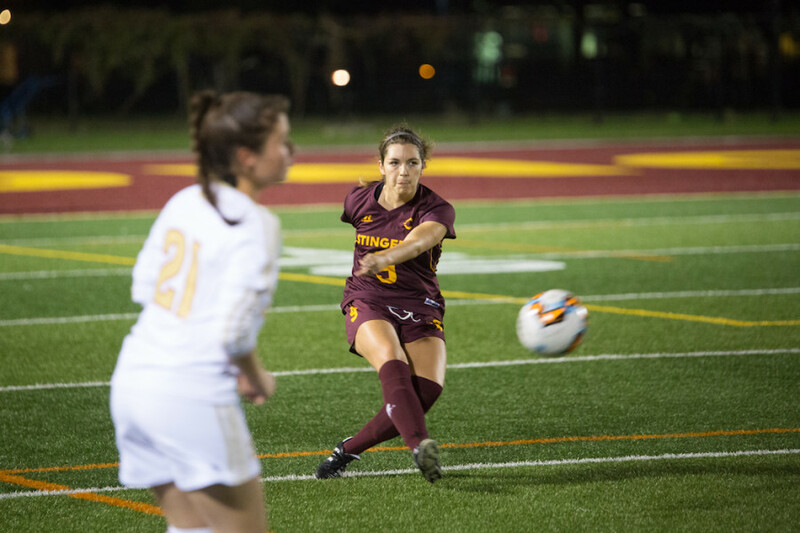 Concordia’s backline frustrated the Martlets all game, preventing passes, blocking shots and denying crosses. Any chance the visitors had in front of goal was a result of poor finishing with little opportunities hitting the target. Sanchez, who couldn’t help but smile after the win, was quick to praise the team’s consistent display throughout the 90 minutes. Although the Martlets held on to most of the possession during the game, Sanchez said his side outworked McGill. “We had everyone stepping up […] they did whatever they had to do [to win], and we saw the difference today,” said Sanchez. Though the Stingers played great defense, the home side found it difficult to conjure up attacking opportunities throughout the game. Concordia forward Sarah Humes came close to assisting the opening goal with a low cross in front of goal seven minutes in, but Courtney Lundell-Streeter failed to convert. Humes would create a similar opportunity in the second half, receiving a pass from Despina Politakis, but the pass failed to get a touch on the receiving end. Sanchez praised Humes’ influence throughout the game. Offence was hard to come by for the Stingers, but the forward was a recurring threat when in possession. 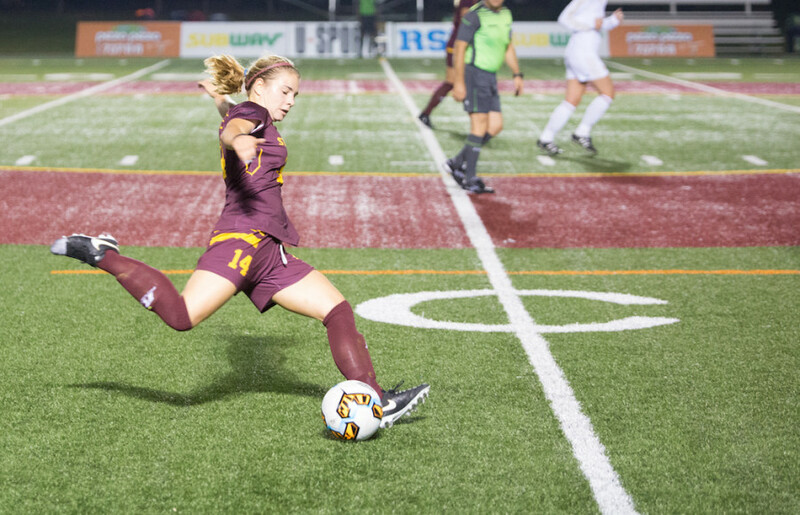 A consistent striker has been lacking from Concordia’s offence this year, but Humes has proven that she could be the solution. Both Humes and Sanchez addressed the team’s offensive end. Sanchez outlined the team finishing as their achilles heel and according to Humes, a few more goals would’ve made for a less hectic conclusion to the game. “We need to come out confident, we don’t need to step back on teams [we need to] press them high [and] try to get goals in the first half,” said Humes. Sedki also stressed that the Stinger’s creativity on offence needs to improve, she said that the team needs to finish the chances they create. Despite some of the issues the team may have, Concordia’s display over McGill showed signs of improvement for a team that has struggled to make its mark. Not only was this a deserved win, Sanchez said, but a timely one, with Sherbrooke up next for the Stingers. That game could prove decisive in the team’s playoff hopes. The Stingers now temporarily sit in fourth place in the RSEQ standings, just one point above McGill. Université de Sherbrooke Vert et Or can tie Concordia in that four slot if they beat the last-place Bishop’s University Gaiters on Monday night. The Stingers are back in action this Friday as the visiting team against the Vert et Or.